In 2006 when Barrie Kosky presented THE LOST ECHO, a play by Tom Wright, using Ovid's METAMORPHOSES and Euripides' THE BACCHAE, I gave myself the task of reading the texts. I do not find reading poetry easy - embarrassing confession! 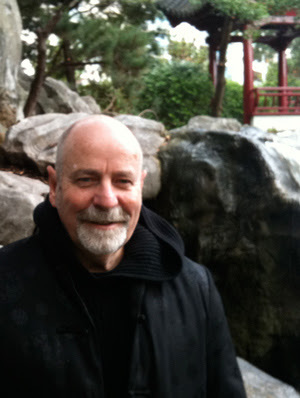 I was fortunate to obtain a copy, a relatively new translation, by the American poet, Charles Martin (2005), and after surrendering to the rhythm of the verse in translation, found myself immersed in a page-turning journey. I loved it. METAMORPHOSES is a 15-book, Latin narrative poem written in 8AD by the Roman poet Ovid, during the reign of Augustus Caesar. It is a myth-historical concoction, tracing the history of the world from Creation to the deification of Julius Caesar, and in English is known, as well, as the 'Books of Transformations'. It deals with some 250 myths in an idiosyncratic structure and gathers the Greek stories/myths into an easy and exciting, often amusing read. Love (Cupid) is at the centre of most of the book. So much of what one reads has been part of one's education, though its origin and details are remembrances foggy, that the recognition on appearance of the characters and stories when reading the Poem are like meeting up with long lost family - there is a found echo, resounding in the mists of one's consciousness. I discovered that 'my heritage' was not only made up from the Fairy-stories (the original and Disney versions), Aesop's Fables and the Old and New Testament stories, that the Catholic Church permitted to be taught, but also, wondrously, of the Greek Myths (even if in a Roman guise). Mary Zimmerman, an American Writer and Director, presented a version of METAMORPHOSES, in 1996, of some of the characters and some of the stories. However, Ms Zimmerman, in her work has used other sources of these myths for her storytelling besides Ovid. For instance, the story of Orpheus and Eurydice is told from two points of view, the first from Ovid's tale, the second from an inspiration of the poet Rainer Maria Rilke. The story of Echo and Psyche is sourced from the work of Lucius Appuleius. Ms Zimmerman's version begins with an edited and general Creation story and swiftly moves into the Story of King Midas (though edited, leaving out the ending!) and it gave one a sense of security and an inkling of a cultural depth, deep from one's DNA, perhaps, that was comfortable to participate in. Director, Dino Dimitriadis, has taken license with some of the material and has also gone on a visual exploration and gender-bending casting option for his production with a keen sense that this work is being presented as part of the 40th Anniversary of the Sydney Gay and Lesbian Mardi Gras. 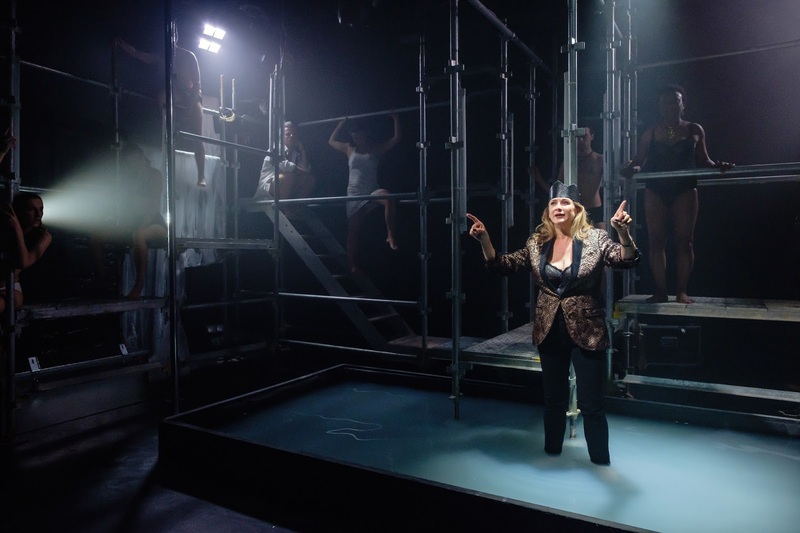 Famously, Ms Zimmerman's play production has used a large pool of water to illustrate, maybe, the 'porous' sexuality of the material in the 'games' between the gods and humans, in the sensuality of liquid - water. It is, then, a kind of triumph to see how Mr Dimitriades and his Designers, Jonathan Hindmarsh (Set and Costume; Assistant, Bella Cannavo), along with Lighting Designer, Benjamin Brockman have created a sensuous environment, with a pool of water, for this team of actors, 5 men and 5 women, to inhabit these tales, in the very small space of the Old Fitz Theatre. There is, too, much nakedness (none of it, to my eye and experience, gratuitous), tulle and leather accoutrement to seduce one into the world of the play and its intentions, all enhanced by that small oblong pool of beautifully lit milky water, surrounded by a maze of silver gleaming scaffold and platforms. Imagistically, in this production, there is much to seduce one in the theatre. Mr Dimitriades has chosen a company of actors that seem extremely comfortable of their intimate appearance in such close quarters. He has also cast some actors who have a physical skill that permits a conjuring of breathless gravity-defying action. Particularly, David Helman, who uses his skills of dance, circus (pole dancing) to mesmeric effect. Others come from a wide range of experience, from the young, such as Zoe Terakes (features as Eurydice) to the more mature, Deborah Galanos (featuring, as King Midas). All of the actors: Claudette Clarke, Jonny Hawkins, Sam Marques, Bardiya McKinnon, Diana Popovska, Hannah Raven and Sebastian Jamal Robinson are fantastically and comfortably committed. What one wished for with this shared Choral text by Ms Zimmerman, from this company of actors, was for voices that were more attuned to one another. All of the actors were 'tuned' to their divided 'word' cuing (mostly) but none were sensitive to the musical sound cuing or scoring. They were not listening to the sound being baton-relayed from one to the next. There were 10 vocal instruments, each distinct, but none harmonised to delivering the music of the story from one actor's sound to another. So, there was no satisfactory orchestral pleasure in the sound of the work. With any text, but particularly with a choral poetic text, it is one of the greater demands for the complete success of the project. - choral musical orchestration. On the other hand there is some extremely interesting and sensitive Sound Design and Composition from Ben Pierpoint that helps suspend the audience to the thrall of the events and figures of the experience. METAMORPHOSES, at the Old Fitz has the content allure of our historical/mythical heritage, the imagistic magic of startling visuals that I can thoroughly recommend, but barely satisfies with the vocal work to give a completely satisfactory transcending experience in the theatre.